According to a Saturday report from KCNA, the Democratic People's Republic of Korea's official news agency, the country's top leader Kim Jong-un said he is still open to a third summit with U.S. President Donald Trump if the US "rectifies its attitude". Kim made the comments during a policy speech on Friday. Blaming the U.S. for only considering its own interests during the second DPRK-U.S. summit in Vietnam's capital Hanoi this February, Kim said it had led the DPRK to question Trump's willingness to improve relations with the DPRK. Noting that he does not accept "the U.S. style of dialogue" which imposes Washington's unilateral demands upon its dialogue partner, Kim said he will "be patient and wait until the end of this year for U.S.' courageous decision, but it will be hard to get as good a chance as last time." Kim's remarks signaled that he wouldn't cling to talks with the U.S. forever, said Kim Dong-yup, a researcher at Kyungnam University's Institute for Far Eastern Studies in the Republic of Korea. "That indicates that Pyongyang is triggering plans to diversify its diplomatic relations with other countries," he said. 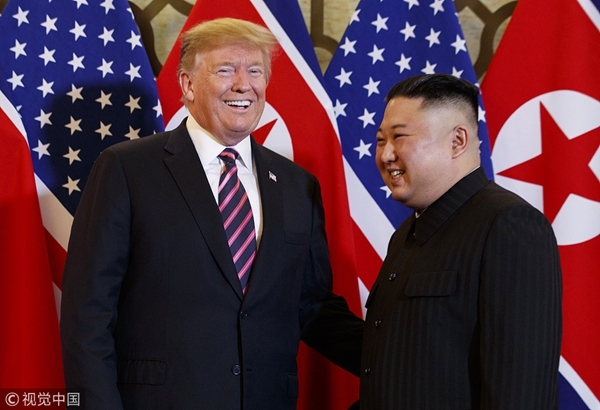 In response to the latest remarks of Kim, Trump on Saturday highlighted the progress made after the Hanoi summit while also expressed cautious expectation of a third one. Trump tweeted on Saturday that, "I agree with Kim Jong-un of North Korea (the DPRK) that our personal relationship remains very good, perhaps the term excellent would be even more accurate, and that a third Summit would be good in that we fully understand where we each stand." Trump said earlier that the third summit with Kim could happen "step by step" but would not be "a fast process". According to Xinhua News Agency, Trump also left the possibility open for a three-way summit with Kim and the ROK President Moon Jae-in, but admitted that would "largely depend on Kim". Talks on denuclearization have stalled ever since the Hanoi summit, which ended abruptly without an agreement. As many analysts believe the breakdown was attributed to a gap between U.S. demands for complete denuclearization and the DPRK demands for significant sanctions relief, some said a third summit won't yield any results if the two sides refuse to make concessions on some core issues. Zheng Jiyong, director of the Korea Research Center at Fudan University, said "no matter how many summits are held, the denuclearization will hit an 'endless deadlock' if they cannot get an agreement on the end goal." Zheng said the two sides could envision a way to square Pyongyang's incremental approach with Washington's "all or never" proposal. "Pyongyang could offer to dismantle its main Yongbyon nuclear complex, along with a freeze on its program, in return for limited sanctions relief. The two sides could then agree on a road map that would lead to Pyongyang complete denuclearization and the full lifting of sanctions," he added. Earlier on Wednesday, Wu Haitao, China's deputy permanent representative to the United Nations, said for dialogue to continue and make headway, the key is to address the legitimate concerns of the parties concerned in a balanced manner, and advance denuclearization and the establishment of a peace mechanism for the peninsula by following a phased approach with synchronized steps as a package solution. Leaders from both the DPRK and the United States said they won't rule out the possibility of meeting again.